Humans may travel to Mars in the next few decades, and NASA is asking for input from the public on how to make missions safe and effective. This image shows an artist's depiction of a crewed mission to Mars. To prepare for future colonies on Mars, NASA is asking the public for ideas on how to keep Red Planet astronauts safe that require minimal resupplies from Earth. The "Journey to Mars Challenge" will give a $5,000 award to each of the three winning participants who describe an original idea that could assist the human exploration of Mars. The proposal must be "technically achievable, economically sustainable, and minimize reliance on support from Earth," NASA wrote in a statement about the challenge. "This could include shelter, food, water, breathable air, communication, exercise, social interactions and medicine, but participants are encouraged to consider innovative and creative elements beyond these examples," NASA added.Because launch costs are considered one of the key barriers to space exploration generally — and Mars exploration, especially — NASA says it could use some ideas on what to bring on these missions and how often to resupply them. The resupply aspect is especially important to the space agency because resupply opportunities to Mars would happen only every 500 days; the respective orbits between Earth and Mars make it more difficult to send spacecraft at other times. By contrast, the International Space Station has resupplies every few weeks or months. The agency is looking for ideas that are backed up by a strategy — "a process to develop, test, implement and operate the system or capability," NASA said. More information about the challenge is available at https://www.innocentive.com/pavilion/NASA. The "Journey to Mars" challenge was announced the same week as the Humans to Mars Summit in Washington, D.C., a conference in which NASA is participating. 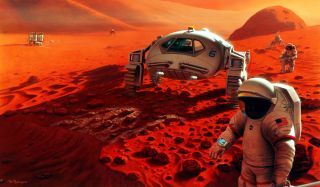 Experts at the summit are considering the best ways to bring humans to Mars affordably within the next few decades. In recent months, NASA publicly repositioned its human exploration program as a series of stepping stones to Mars. Examples include the current one-year mission on the International Space Station — which is intended to help scientists better understand space's effect on the human body — and a proposed asteroid mission to test human capabilities and technology in deep space.